I am a flat shoe lover through and through. Maybe this is because I am 5'9" and I like to not be much taller than anyone I am with, or maybe it's because of the comfort. Either way, 90% of my working shoes are flats and I'm perfectly fine with that. I have a slight obsession with Tory Burch, and day dreams of Salvatore Ferragamo, but I digress. Looking for that perfect work flat? Look no further! Below you will find options in many price points to give you that polished, professional look while still maintaining the comfort (and for the tall: your height). Hey a girl can dream, can't she? 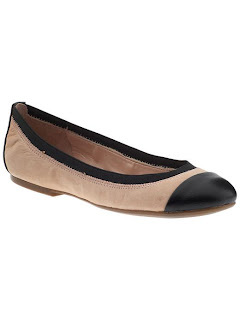 I have far too many pairs of Tory Burch flats, but one I do not have is this black with the classic gold. Purchase to come. This pair goes for under $70 and will go with almost anything. What is your favorite work flat? Leave comments below and let me know! Love the Chanel (currently sporting that pair!) and the Ferragamo, so comfy! The Ferragamos are included in Bloomingdale's Friends & Family sale right now!